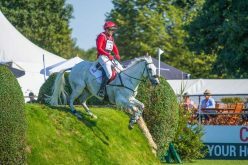 The Christie’s International Real Estate’s Vaulting at the FEI World Equestrian Games™ Tryon got off to an outstanding start, with vaulters’ posting breath-taking scores in the initial compulsory rounds. 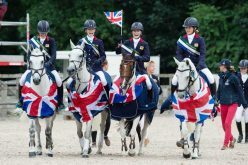 The day was full of excitement, drama and exceptional physicality from both vaulters and their equine counterparts. The Squad Competition got the action underway, with Team Brazil the first vaulting nation to christen the world class facility here in Tryon. Coming into the event, it was expected to be a tough battle between the three vaulting ‘heavyweights’; Germany, Austria and Switzerland, with other countries looking to capitalise on mistakes from these renowned vaulting nations. 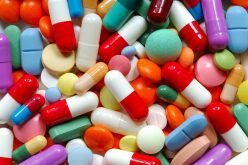 To everyone’s shock, after the conclusion of the initial compulsory round, the doors have been thrown wide open, the race for the medals is on. Switzerland threw down the gauntlet in impressive style, performing their test with harmony, confidence and flawless execution. Alongside the phenomenal Rayo de la Luz with Monika Winkler-Bischofberger on the lunge, they posted a whopping 7.979. Rising to the occasion, they proved they are here with the intent to leave with gold around their necks. A breath-taking performance to kick off their quest for the top step on the podium. Team Germany on-board Danny Boy with Patric Looser anchoring the team as lunger, were able to show a confident and assured set to occupy the silver medal position (7.794), providing breathing space ahead of their closest competitors, Team Austria. After day one the Austrian team currently, narrowly reside in third place, together with Alessio L’Amabile and Maria Lehrmann the team posted an out of character 7.355. Hot on the heels of the Austrian team, America, who alongside Carolyn Bland and Diva scored 7.349. The squad competition no longer the assured outcome some expected. Team Italy sit close behind in 5th on 7.179. 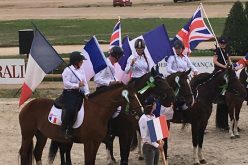 Heading into the Female Individual class at the FEI World Equestrian Games™, it was expected to be a close fought battle, with multiple medal contenders coming to the fore throughout the 2018 season. The standard throughout the initial compulsory test – outstanding. At the conclusion of the first round, ten competitors were sitting on a score in excess of 8 with Austria’s Katharina Luschin leading the pack with a jaw-dropping test, scoring 8.506. 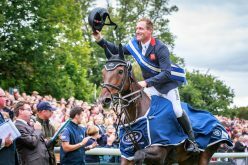 Late to go in the class, Luschin showed breath-taking control and composure on-board Fairytale 6 with lunger Maria Lehrmann, to move ahead of current FEI European champion Kristina Boe. 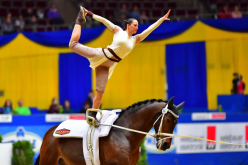 Testament to the quality of the vaulting we are witnessing at the FEI World Equestrian Games™, Kristina Boe scored an impressive 8.347 with long-time team, Don de la Mar and Winnie Schlüter. 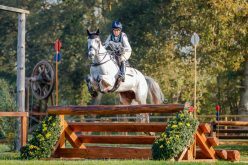 Freestyle specialist Kristina will have her sights firmly on catching current leader Katharina Luschin as the competition progresses. The Austrian’s asserted their dominance in the female category, highlighting their compulsory prowess, with Daniela Fritz currently occupying the bronze medal position (8.294) and Lisa Wild sitting close behind in 4th (8.294) – all three Austrian competitors partnered up with Fairytale 6. Denmark’s Sheena Bendixen sits in 5th (8.230) with Germany’s Sarah Kay in 6th (8.203). Reflecting the tone of the day, the Male Individual Class got underway in equally dramatic, awe-inspiring fashion. 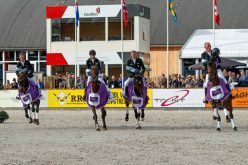 At the close of play, the top three male competitors all sit on 8.4, with Germany’s Thomas Brüsewitz leading the pack, with renowned horse Danny Boy and 2010 FEI World Equestrian Games™ winner Patric Looser on the lunge (8.480). Fellow German compatriot Jannik Heiland sits in second place (8.468) after an extremely harmonious compulsory showing on Dark Beluga lunged by Barbara Rosiny. Click here to view the full results of the day.